Left to Right: Walter, Jennie and Stanley Luczka. 18 years in an auto accident. Allan married Nancy Huppe in 1979 and they reside in Winnipeg not far from his mother's home. Jenette remarried in 1972. Her husband, Irvin Goodman, was born and raised in Winnipeg. He is a self­ employed photographer and has two sons from his previous marriage. Jenette is studying law and expects to be called to the Bar in June, 1984. When her son Walter died in 1960, Anna Luczka sold the farm and moved to Winnipeg to live with Jennie and Howard. However, this was an unhappy time for her as she disliked the city and missed Erickson and her friends. She moved back to the town. She was able to take care of herself in her own home for quite some time. She passed away peacefully in the senior citizen's home in Shoal Lake in 1974 at the age of 85. Larry, son of Ivan and Jessie Squance, was born at Grandview, Manitoba. he was raised and educated in the Mountain Gap district of Grandview. Larry married Linda Jones, daughter of Howard and Ruby Jones on August 7, 1959, at Gilbert Plains, Manitoba. Linda attended school at Grandview. They resided on Larry's father's farm until March, 1963, when he commenced employment at Grandview Co-op. In 1966, he accepted a Manager's position at Sandy Lake Co-op Lumberyard, Sandy Lake, until November, 1970, when he became General Manager of the Company. In May, 1980, the family came to reside at Erickson where Larry accepted the position as General Manager of the Erickson Co-op Ltd. They are members of the Erickson Lutheran Church. Larry is an active member of the Erickson Lions Club, Chamber of Commerce and the Mixed Curling Club. Linda has worked for the Rolling River School Division at Sandy Lake school since 1968. She is an active member of the Erickson Ladies' and Mixed Curling Clubs and is presently serving on the Erickson and District Recreation Committee. Larry and Linda have two daughters, who were born at Grandview, Manitoba, received their education at Sandy Lake and Erickson Collegiate. The girls were both married at the Erickson Lutheran Church. Sherry, was born September 6, 1960, and married Dennis Green on September 19, 1981. They reside in Winnipeg. Tracy, was born April 3, 1963, and married Harold Teskey on July 17, 1982. They have a son Jeromy, born April 17, 1983. The family reside at Douglas, Manitoba. My father, Wasyl Fred Stechkewich, was born in 1891, in Austria, Galicia (presently Western Ukraine). There were six children in his family and he was the eldest. He received his early schooling and training as a carpenter in Ukraine. In 1910, at the age of 19 years, he came to Canada, leaving behind all his family in Ukraine. No other members of his immediate family ever came to Canada, nor did he see any of his family again in his life. On arriving in Canada he came to Sandy Lake, Man., where he stayed a short time with an Uncle and Aunt, the John Burdeny family, who emigrated to Canada a couple of years before my Dad. My father then went to the Saskatoon/Kindersley area in Saskatchewan, where he found work on the railroad. He stayed in Saskatchewan until approximately 1915, and then returned to Manitoba and worked as a farmhand in the Oak Lake and Sandy Lake areas. In 1923, he leased a farm near Sandy Lake. 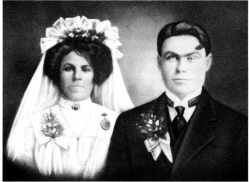 Wasyl married Mary Byskal in the fall of 1923.